One of the best ways to cut down on caloric intake is to eat more of your food in a raw state. The less you do to the food, the better it is likely to be for your body. So in an effort to cut back on fats, etc., I experimented with some fresh tuna the other day with some mixed results. First of all, you need a really good slice of fresh tuna, and sometimes you get it without any muscle or whatever the white bits are, and sometimes you don’t. 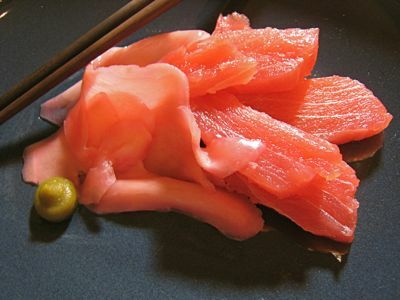 The really good Japanese restaurants will serve you tuna sashimi that is a bright or nearly dark reddish color, without “veins.” So what was I futzing with the other day? A 1/2 kilo block of reasonably good, but not brilliant, sashimi quality tuna from Seaside market, which was cut into sashimi sized logs. Then I cut these further into about 1 inch square pieces and laid 7 of these squares on a piece of plastic wrap. Covered this with another piece of plastic wrap and carefully pounded it with a flat meat pounder into a roughly round shape with a relatively thin (1/8th inch or so) layer of tuna. Place this in the fridge for about an hour before you want to serve the tuna. But not one to give up so easily, I made a second plate that I drizzled with lemon, kikkoman soy sauce nd julienned pickled ginger and salt and pepper. This version was better, in my opinion, but still a little bland. But when I added thin slices of pickled ginger, this really transformed itself from boring to delicious, a 8.0/10.0, perhaps. Again, the risk is that the ginger overpowers the delicate, and sometimes appropriately described, tasteless fish. 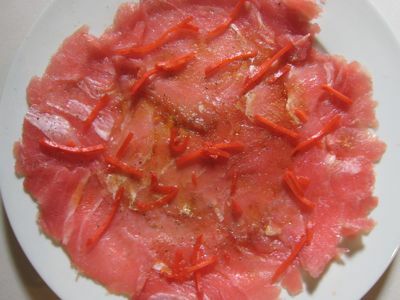 And with the last piece os tuna, I decided to just slice it up and present it on a small plate, with sliced pickled ginger and some wasabi for The Kid, who loves sashimi but wasn’t sure about the carpaccio experiments… this with some good soy sauce, was a good as it always is. All of this, btw, qualifies as diet food in our house! Edwin D., to be a bit more factual, salmonella is most typically present in eggs, raw eggs, egg shells, raw meat, unpasteurized fresh milk, etc. as well as on some foods that are cooked but allowed to sit for too long… the risk of salmonella, even from eggs, is estimated by the USDA, accdg to this site, to be ONE potential egg exposure per person EVERY 42 years. And just because there is a bad egg, doesn’t mean you will get salmonella, since most folks cook their eggs. As such, salmonella is a minor risk in the universe, let alone with this tuna fish, unless it was sitting on an infected chicken or duck egg, but I do agree, it is still a risk. I would, however, posit the lovely thought that you are more likely to eat from a plate of restaurant food, where the waiter/waitress or cook did NOT wash their hands before coming out of the bathroom, and where there was likely no toilet paper, and they may have left some nasties on the edge of your plate, much more likely to cause you all kinds of stomach problems… AND THE RISK of that scenario is far greater, though still small, than salmonella… As another lovely thought, it is estimated that between 50-70% of all people using public bathrooms do not wash their hands, so in the course of a normal business day, when one shakes say 5 people’s hands then touch their faces or noses or mouth, that there is a similar risk of something nasty happening. EVen opening a door using the doorknob presents HUGE relative risks. The point of this comment being… we should be aware of risks, but we shouldn’t make them out to be more than what they really are. Having said that, with my luck, I will probably get amoebiasis the next time I buy taho from my suki street vendor… :) Oh, and a final tip, if you want to eliminate some types of potential bacteria in raw fish, some folks suggest you freeze the fish such as tuna for at least 1 day, before you defrost it just before using it… but true sushi lovers would consider that a sacrilege, I suspect. Couldn’t agree more. I think lemon is always a good choice for fish. Balsamic is too strong especially for a fine fish like tuna. I prefer my tuna seared slightly though. Yes Lee, orphaned and exploited by her wicked step-mother, Escherichia. That I why I love this blog. I love the articles, comments and responses. Honest, Creative and Entertaining!!!!!! I want to share with you a delicious raw tuna recipe I found in a William Sonoma cookbook you may enjoy. Spoon the poke into individual bowls. Serve chilled. Garnish with cilantro sprigs. 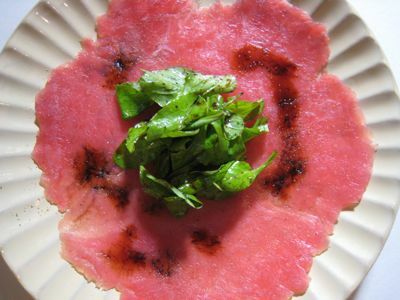 wasabi sauce is best for tuna carpaccio. great with the japanese version of cole slaw! From another cooking blog, I learned about Ponzu sauce. Loved it. Tried it on different sushi including tuna. Really great topped chopped chives and pickled ginger on the sides. For the tuna sashimi lovers out there…a word of caution: as with everything else, the key is moderation. I am talking from personal experience. We eat Japanese food at least once a week. My 15 year old has undergone lab test for mercury poisoning. We are talking 6 times above the normal level. Had I not insisted on seeing a neuro pediatrician, one day, he could succumb to mercury poisonng. Now, he is on a strict NO TUNA IN ANY FORM DIET! It has been 5 months since then and the level has gone down tremendously. we all learn so much from this blog- from MM and the readers as well. Apicio what is escherichia? Lex, that’s my favorite menu at Bone Fish Seafood Resto served with rice pilaf here in the Southeast. Thanks for the recipe. I’ll try to make it after my next deep sea fishing in San Diego next month . . . regards. Sonia, that the e in e coli. lee and apicio, you guys provided my morning laugh! 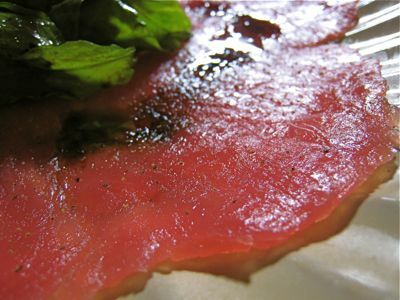 MM, i’d take tuna sashimi,sushi and kinilaw over carpaccio or pan-seared tuna anytime. bettyq, that is scary! tuna, mackerel, and a few other species have naturally high levels of mercury, but some have even higher, depending on where they have been feeding. because of this, some places (the US, included, i think) routinely advises pregnant women to refrain from eating tuna (even the canned ones). yeah… Escherichia and her evil daughters….poor Salmonella, she the one with the seven dwarfs? Vowing revenge on his English teacher for making him memorize Wordsworth’s “Intimations of Immortality,” Warren decided to pour sugar in her gas tank, but he inadvertently grabbed a sugar substitute so it was actually Splenda in the gas. My family loves sashimi. We haven’t made tuna carpaccio though. 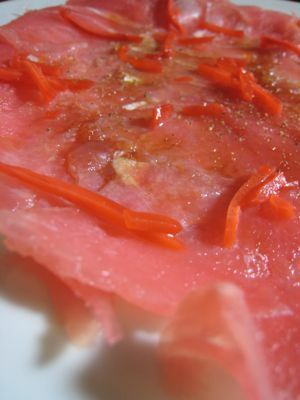 My husband and son would probably not like the thinness of the tuna pieces in carpaccio, they enjoy a really good thick slice of raw tuna or raw salmon either neat or with wasabi/soy sauce. With regards to the nasties in food, if it’s a quality ingredient, hygienically prepared and properly handled, there is no reason to fear the presence of food-borne bacteria. thanks for the link apicio! “Die, commie pigs!” grunted Sergeant “Rocky” Steele through his cigar stub as he machine-gunned the North Korean farm animals. Lee, Salmonella is the one with the glass bacteria. She had to be home by midnight. yes Cecile or her coach will turn into a mold spore. mm, you cook well and now, seems like the photos look so much better too! lol! thanks for the laugh guys. I haven’t had a good laugh in a while: I needed that. Muchas gracias tres caballeros (Lee, Apicio, Cecile J)! I got sidetracked: tuna (& beef) carpaccio is pretty much a staple serve in any restaurant in Noumea. A few capers with a light dressing of creamy herbed vinaigrette, optional s&p to taste.